COMFORTABLE 1 BEDROOM GULF FRONT CONDO THAT SLEEPS 6! 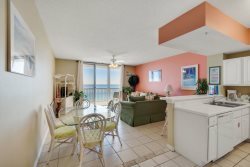 "Tequila Sunrise" is a cute 1 Bedroom 1.5 Bath condo that overlooks Navarre Beach and the Gulf of Mexico... you will love this 5th floor condo and it's breathtaking views! This condo offers comfortable decor, tile floors in the main living areas, a dining area that seats 4, a fully equipped kitchen, wireless internet, a king bed in the master bedroom, resort style twin bunk beds in the hallway, a queen sleeper sofa in the living room, a Jack and Jill bathroom with tub/shower, a flat screen TV and DVD player in the living room and a private balcony with views of Navarre Beach. The staff were very friendly, courteous, and helpful. We were always met with a smiling face. The location was great! Condo was fine. Very brief experience. Basically checking in and out. Everyone we talked to was very nice. The pictures that are included in the advertising are perfect. You really are right next to the pier and restaurants. We loved the live music at night. The kitchen is well stocked. The front desk was quick and friendly. This is one of the nicest properties we have stayed at. The beautiful gulf view from the balcony was therapeutic. Condo was nice & clean. The beds were comfortable. I didn't have any problems with the dishwasher, washer or dryer. The pier was in walking distance, which was great for my husband who fished every morning. I enjoyed reading a book on the balcony in the morning. The view is so beautiful & peaceful. Also, enjoyed sitting out on the balcony at night & listening to music from local bar that's next door. We had a great visit & we will be back! The experience at the Navarre Properties was awesome! The friendly staff was very helpful and finding the property was a breeze. This is definitely somewhere my family and I will stay again! The property that we stayed in while visiting Navarre was great. It was well taken care of and was in excelled condition. The kitchen was stocked with whatever I needed to use and the rest of the property was very clean. My family and I had a great stay and will be visiting this property again. Thanks so much for making our vacation a great one!! It was absolutely so peaceful. I had coffee at sunrise and wine at sunset!!! I loved it!